It's as if we took a trip into space with our best friends, and they turned into mutants and attacked us. Electrons are the best friends we've ever had from the subatomic world. We harness their flow as electricity to power all of modern life -- everything from cell phones and laptops to light bulbs. In space, however, electrons can turn against us. Boosted to almost the speed of light, "killer electrons" can knock out computers, pierce spacesuits, and damage the tissues of astronauts. New research using NASA's STEREO spacecraft is discovering exactly how this happens. 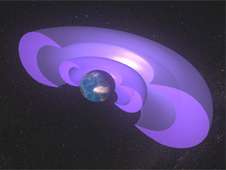 Killer electrons lurk in the radiation belts surrounding Earth, called the Van Allen Belts after their discoverer, James Van Allen. Shaped like two concentric pumpkin shells around the Earth, the Van Allen Belts are areas where electrons and other electrically charged particles get trapped by Earth's magnetic field. Something happens there that turns ordinary electrons into high-speed demons. Professor Cynthia Cattell of the University of Minnesota led a team that has found a likely culprit -- the most powerful radio waves of their kind ever detected in the Belts. "No one has ever seen waves this big," says Cattell. "They're more than 10 times bigger than what we knew about." The waves studied by Cattell and her colleagues are known as whistlers, a special type of radio-frequency wave that has been known since World War I, when they were discovered to be generated by lightning. The newly found whistlers have a lot in common with the ocean waves off Waikiki Beach. Both pick up surfers--whether people or electrons--and transfer energy to them. Electrons that absorb enough energy from whistlers can hurtle along at up to 99 percent the speed of light, which translates to 184,000 miles per second. The most startling revelation was how fast it happens. It had been thought that multiple interactions between whistlers and electrons, taking place over a span of minutes or even tens of hours, were necessary. "But we saw that electrons can be energized in a tenth of a second," says Cattell. The key to the discovery lay in a couple of identical instruments designed by Keith Goetz, a physicist at the University of Minnesota. They are aboard the twin spacecraft of NASA's STEREO (Solar TErrestrial RElations Observatory) mission, one orbiting the sun ahead of Earth and the other orbiting behind. The idea is to use the widely separated spacecraft to study the sun in 3-D. The focus of Goetz's instrument -- called TDS, for time-domain sampler--is waves in the solar wind, a stream of charged particles flowing from the sun. The TDS's were intended to collect data after the two STEREO spacecraft had settled into their respective orbits. But that didn't stop Goetz from insisting that they be turned on early, when the two orbiters were still near Earth. And so they were. And thus the antennas of the TDS were ready on December 12, 2006, when the big break came. On that day the two spacecraft sailed through the Outer Van Allen Belt in tandem, one about 84 minutes behind the other. During that short interval, the Outer Belt was hit by a "magnetospheric substorm," an explosive release of energy from Earth's magnetic field. The substorm stirred up the massive whistlers, which were detected by the second STEREO spacecraft. STEREO was launched in October 2006. STEREO is sponsored by NASA’s Science Mission Directorate, Washington, D.C. NASA Goddard Space Flight Center’s Solar Terrestrial Probes Program Office, in Greenbelt, Md., manages the mission, instruments and science center. The Johns Hopkins University Applied Physics Laboratory, in Laurel, Md., designed, built and operates the twin observatories for NASA during the 2-year mission.